Coolpapers is one of the best iPhone wallpaper app available, But the LITE version has a 5 wallpaper download limit, If you want to download unlimited wallpapers from Coolpapers app then you'll need to Get Coolpapers Pro which costs about $2.99 from the iTunes AppStore. Don't Worry Guys, I'll Tell you How to get one for Free. Unless you have an Jailbreaked iPhone. 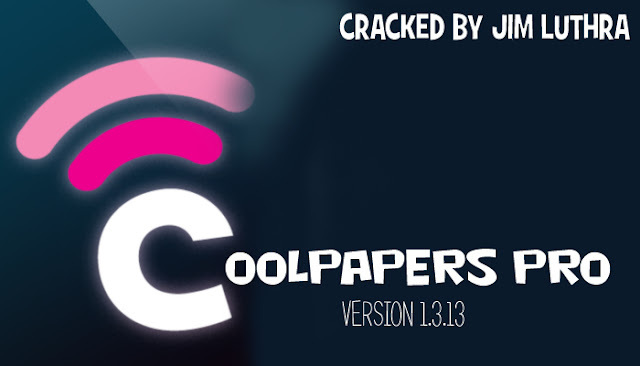 I've tried each and every Coolpapers Pro ipa from the internet, But nothing seem to work, After 5 wallpapers get downloaded a Watermark starts to appear on other wallpapers disallowing you to download them. So I decided to Crack one myself, I downloaded an ipa from AppCake and installed it in my iPhone, then i opened my iPhone in iFunbox and going through my iphone, I deleted that watermark file and then gave a Reboot, After Reboot I started coolpapers Pro app and tried to download a wallpaper. This time there was no watermark But as soon as i tapped on Save wallpaper a Page indicating a Buy Now button appeared......The app didn't worked. So instead of giving up, I decided to crack it again. This time i Deleted Coolpapers pro from my iphone and then installed a new ipa from AppCake, again i went through my iPhone using iFunbox and again I deleted that watermark. Now when i opened app and to check i saved 10 wallaperes , this meant that the 5 wallpaper limit is removed and the crack is running successfully. The Reason for Fail first time was that i had downloaded 5 wallpapers and then i cracked it, So the Buy now thing was activated befor i cracked. but when i did everything Fresh without opening app after installation and then cracking..This time Buy now was not activated because watermark was removed and the Crack was successful. So I cracked an ipa file, Download that ipa from the below link and install it to enjoy unlimited wallpapers dowload. If you want to get Coolpapers Pro with Unlimited Wallpaper downloads, Just download the Coolpapers Pro.ipa from below link and install it. Download Coolpapers Pro [working] ipa.